(L) Lake near Aligarh, India, heavily polluted before start of restoration work. (R) Same lake two weeks after starting restoration work. The boy is spraying Phycoplus. onds, lakes and other waster bodies are getting polluted through discharges from agricultural run-off, sewage discharge, industrial effluents etc. Due to excessive loading of chemicals and nutrients (eutrophication) sudden blooming of hazardous algae – mostly blue green algae – occurs, eliminating other species of algae which usually form a part of the natural food chain. Duckweeds or other floating vegetation are also common, cutting off light which results in anaerobic conditions developing in the lower layers, leading to destruction of ecosystems. Water becomes turbid and foul smelling and very high Biochemical oxygen demand (BOD) and chemical oxygen demand (COD) associated with huge populations of coliform bacteria. Restoring these wasted water bodies is a major challenge, and our company, PERC, has recently taken up this challenge and developed a microalgae-based product. Phycospectrum Environmental Research Centre (PERC), Chennai, has been involved in developing and implementation of microalgae-based treatment technologies for handling industrial effluents in India and abroad. pH correction, color removal, odor removal, COD and BOD reduction, and sludge reduction have been successfully implemented by PERC algal technology. Recently microalgae technology has been found to be suitable for handling reverse osmosis (R/O) rejects from desalination plants, leather industries, textile industries, etc. replacing the more expensive and energy intensive multiple effect evaporators (MEEs). Integration of pulsed magnetic field (PMF) technology, jointly developed by PERC in collaboration with Madras Institute of Magnetobiology, Chennai, has been very effective in enhancing the efficiency of algae-based remediation systems. PERC has selected a few robust and natural microalgae and customized micronutrients to support them and converted them into a product, Phycoplus. If administered, the treatment results in breaking of the dominance of the polluting algae and stripping off essential nutrients for the duckweeds to make them disappear. Phycoplus microalgae colonizing results in significant reduction in coliform bacteria, BOD and COD. Water becomes transparent and foul odor is gone. 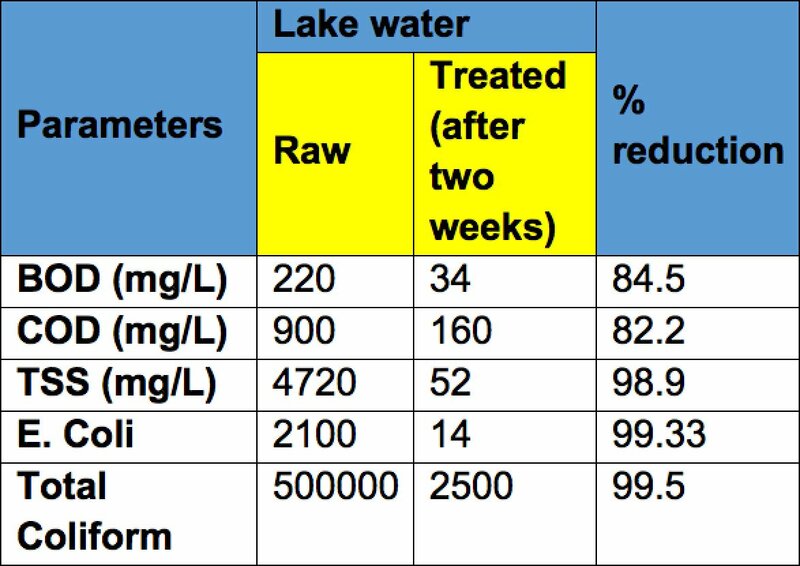 Parameters of lake water before and after restoration. (Tests done after four weeks show further reduction in these parameters). This technology has been recently demonstrated by PERC in a village lake near Aligarh, Northern India. This lake received discharge from households of the village and agricultural run-off which contain huge amounts of nutrients and organic loads polluting the lake completely. The lake was covered with floating cyanobacterial mats and duck weeds which prevented light penetration. Water had a foul odor and color was blackish – and the village people almost abandoned this lake. After PERC’s restoration work the lake water became transparent, COD and BOD reduced to a minimum and there was a significant reduction of coliform bacteria. Floating cyanobacterial mats and duckweeds vanished. Periodic addition of Phycoplus helped maintain the lake from further eutrophication and fouling. PERC is researching in more ponds, lakes and small drains to test this algal technology further before taking up larger projects in India and elsewhere.